Suggested by the University of Saskatchewan that this could be the berry of the Future! 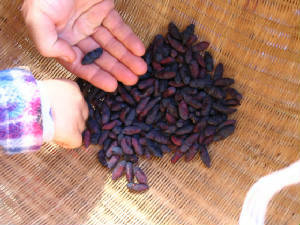 We agree and will continue to supply our customers with these tasty berries for 2009. One of our producing honeyberries! Low growing shrub makes it easy to pick. For gardners desiring an organically grown orchard, this is the berry for you. And just wait until you taste the berries !!! 'Blue Belle' TM exciting and new!! This is new to the Canadian market and the fruit of the future! An edible honeysuckle from eastern Siberia that is cold hardy to - 50 C. A small shrub with an early crop of large bluish purple berries that ripen ahead of other berries. Excellent fresh eating, on ice cream, jelly, jam, juice and good for freezing. These seedless berries taste like a wild blueberry but are shaped much different. Highly recommended for everyones back yard or orchard. Must have another honeyberry variety for cross pollination. 3 ft tall X 3 ft wide. Extremely drought tolerant. Likes well drained soil. Pick berries as soon as they are ripe. Very resistant to disease and pests. 'Berry Blue' TM exciting and new!! Identical to the Blue Belle, except a bit more vigorous. Proven to be very resistant to disease and pests. 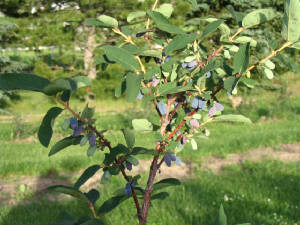 Large blueberry tasting fruit on small shrubs and incredibly winter hardy for the Alberta climate. Must have another honey berry variety for cross pollination. One variety can pollinate up to five of another variety. A must have! 4 ft tall X 3 ft wide. Drought tolerant. Similar to the Berry Blue in its vigour and size. The pollinator choice from the University of Saskatchewan. Berry comparable size to the Berry Blue. Disease and pest resistant, and do very well in the northern climates. An exciting new crop for the Canadian prairies! Harvest one week earlier than the Berry Blue. The Cinderella is the newest release to the market place. The bushes are a bit smaller than the other varieties, but the fruit a bit larger. Drought, pest and disease resistant. Perfect for any backyard or for full orchard. Super for fresh eating or making jams and jellies. Some believe these berries taste like wild blueberries, and others taste a hint of black currant. 1) We have found that these plants do not like to grow in very wet soil. Plant in areas where their is good drainage. 2) You must have two varieties for cross pollination. Up to 5 plants in one variety and then at least one plant in another for pollination. These honeyberries are very popular so order early and don't miss out. Price list and order form will soon be available for 2009.